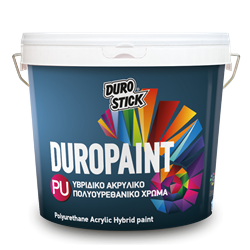 High quality polyurethane acrylic paint of new and advanced Hybrid technology. Distinguished for its strong adhesion to new and existing, sound substrates, its high coverage, and its water vapour permeability. It forms a water-impermeable membrane that maintains its flexibility from -20°C and up to +80°C. It does not saponify and acts as an effective carbonization barrier. It has excellent resistance to adverse weather conditions and UV radiation. Ideal for all types of exterior and interior surfaces made of concrete, plaster, cement board, and drywall. Ideal for all surfaces that are subject to frequent cleaning, as it presents exceptional resistance to surface washing (ten times higher than ordinary acrylic paints) without emulsifying. Ensures unique durability when applied to buildings located in coastal or mountainous areas. Certified ‘cool’ paint by the University of Athens, as Polyurethane and Acrylic paint for exterior surfaces. Colored in a wide range of PAL colors through the color creation system, Color Collection of DUROSTICK. Available in white that can be colored in 120 colors using DUROCOLOR, the Measuring System for Shade Rendering in 20ml syringe packaging. 1lt/10-12m2 per coat, on properly prepared surfaces.